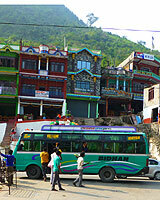 There are three options if you're travelling between Kathmandu and Pokhara or Chitwan..
1. Flying - both destinations are less than 40 minutes by plane. This would be the most expensive option. 2. Bus - A very cheap way way to travel, a fraction of the cost, but could take you up to 8 hours with limited stops. The third option is to meet half way and hire a Taxi. The cost would be not much less than the flights but would work out cheaper still if there are two or more of you. When going to Chitwan I decided upon the Taxi. I did this solely to experience the journey, to see the sights and for 'personal plumbing reasons' could ask the Driver to stop when required ! The other advantage is that all Taxi Drivers know the interesting spots for photographs and usually fill you in on much information as you go along. I had many great experiences whilst in Nepal and this journey is right up there amongst the best. 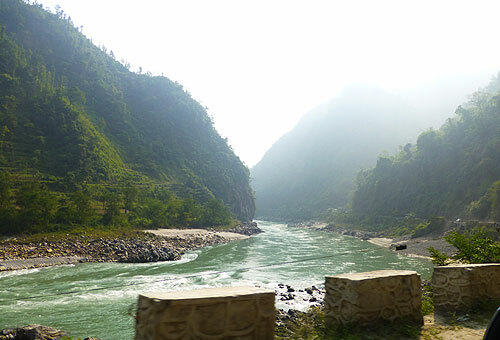 After reaching the highest point just outside Kathmandu, the road just goes down and down, the Prithvi Highway as far as Mugling runs alongside the fast running Trisuli River, a tributary of the Narayani River which eventually flows in the Ganges in India. This lined with steep rising hills and to see some of the houses on these makes your trip to the Supermarket seem the easiest thing in the world! All along this route you will see many colourful Villages. More toward Kathmandu there are spectacular views looking down on to the Rice Fields and as you descend the road is lined with Banana Trees. The Villages on the other side of the River are got to by various means from Suspension Bridges, Self propelled Cable Cars or just rocks in the River. 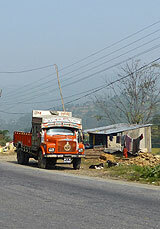 At Mugling there's a junction, you go northwards to Pokhara or in a southerly direction to Bharatpur and Chitwan. All along you will see the passing highly decorated Lorries making their way up from India, along with packed out buses it all makes up for quite an experience. 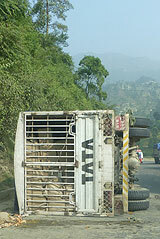 In the 6 hour journey to Chitwan and the 6 hour journey back I only saw one accident as the picture on the right depicts. You can't deny that some overtaking is quite an eye opener but my Driver seemed to stay well clear of that! It's a road of much diversity, you can go from a really smooth bit into a sudden stretch where the holes can be more than one foot deep, these being caused mainly by landfalls. If you take this option ask the Driver to stop at the good places for panoramic views and other such interesting places, they will gladly oblige. Please look at the Prithvi Highway Photo Gallery and I hope that will give you some idea of this wonderful trip.